Melanie, a joint project of Tanghalang Pilipino, the resident theater company of the Cultural Center of the Philippines, and global organization UNICEF, which has toured different areas in Metro Manila, returns this December for the celebration of World AIDS Day. Penned by playwright Layeta Bucoy, Melanie brings together a powerful ensemble, which includes the Tanghalang Pilipino Actors Company, with guest artists Phi Palmos, Cyril Balderama, and Anton Nolasco. Using Forum Theater as a device, the production effectively inculcates important information about HIV and AIDS to the audience by involving them into the performance through an interactive ‘breaking of the fourth wall’. This way, audiences feel that they are part of the process, and at a greater extent, are involved in creating an effective solution. In order to equip the actors with the right skills in mounting the production, they underwent rigorous workshops and seminars which helped broaden their understanding of, not just the principles behind Forum Theater, but of the essential information on HIV and AIDS. Melanie tells the story of gay parlorista who became the subject of gossip after his death, due to an AIDS-related complication. At his funeral-turned-disco party, his friends and colleagues gather to discuss the horrors of ‘becoming like Melanie’, showing a fear of infection, which is caused by sheer ignorance on the virus and the disease. Each one has a story to tell; and each one has a fear to conquer. In the end, everyone is left with an eye-opener: we are only afraid of what we don’t understand. Melanie is directed by Tanghalang Pilipino’s Associate Artistic Director Tuxqs Rutaqio and is written by Layeta Bucoy. Jed Balsamo creates the music, while John Batalla designs the lights. 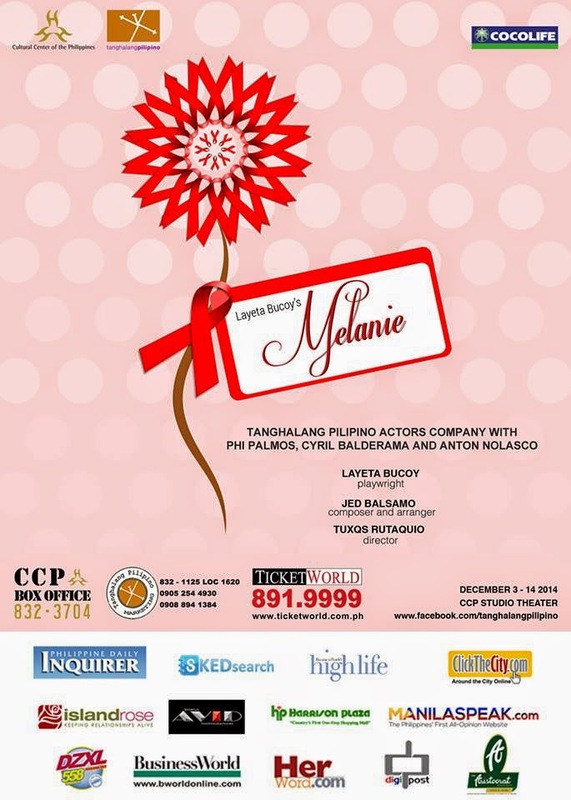 Melanie runs at the CCP Tanghalang Huseng Batute (Studio Theater), from December 3-14, 2014, Thursday to Sundays, at 7:30pm. Tickets are priced at Php800 and Php600. Discounts 20% discount on the regular price for senior citizens, government employees, military employees and PWDs. (Please present valid ID). Tickets can be purchased at Ticketworld, or you may call Tanghalang Pilipino at (02) 832-1125, local 1621.